A recent study from the Centers for Disease Control tested a demographically diverse group of almost 400 Americans for evidence of exposure to BPA and found that 95% of study participants had the chemical in their urine (Calafate 2005; Wolff 2007). BPA has been linked to a variety of health outcomes which are prevalent and in many cases increasing in the United States and responsible for a major toll on our collective health. 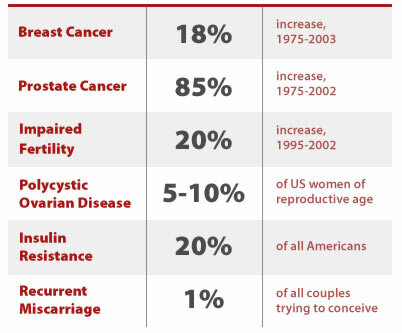 These include breast and prostate cancer, and infertility (Maffini 2006). There are few published studies on the effects of exposure to BPA in humans. Japanese scientists found that women with polycystic ovarian syndrome had higher serum levels of BPA relative to women with normal ovarian function, and that there were positive correlations between BPA concentrations and androgen levels (Takeuchi et al. 2006). Polycystic ovarian syndrome is the most common form of female infertility in the U.S., affecting 5 to 10 percent of American women. Another study found an inverse relationship between BPA concentrations and the presence of complex endometrial hyperplasia; the authors suggested that this surprising finding pointed to a more complex relationship between BPA exposure and estrogen dependent diseases than previously thought. (Hiroi, Tsutsumi et al. 2004) Lastly, a study of women with a history of recurrent miscarriages found they had higher serum BPA when compared with women with normal pregnancies, leading the authors of the study to conclude that "exposure to bisphenol A is associated with recurrent miscarriage" (Sugiura-Ogasawara et al. 2005). Recurrent miscarriages affect one percent of American couples trying to conceive (Rai 2006). Men with occupational exposure to epoxy resins were found to have decreased secretion of follicle stimulating hormone when compared with men without occupational exposure to epoxy resins (Hanaoka et al. 2002). Follicle stimulating hormone is critical to sperm formation; diminished secretion of this hormone in men can result in reduced sperm concentration and infertility. Exposure to Bisphenol A is widespread in the United States, and it has been linked to a number of adverse health effects in animal studies, including breast and prostate cancers, impaired fertility, and insulin resistance (Maffini 2006). While a few studies link BPA exposure to altered reproductive system function in women and men, but these human studies are costly and complicated to perform. Thus animal studies will always provide an indication of potential impacts to human health. The health impacts of BPA exposure in animals bear special consideration in light of disease trends in the American population. The US is noted to have one of the highest incidence rates for breast and prostate cancers in the world; lifetime risk for these cancers has steadily risen over the last two decades. Cancer rates now reflect a 1 in 8 lifetime risk of breast cancer for women, and a 1 in 6 risk of prostate cancer for men (SEER 2006). Invasive female breast cancer increased an average of 1.5 percent per year between 1973 and 1996, for a total increase of 25.3 percent. Among those 65 and younger, breast cancer incidence rose 1.2 percent per year, corresponding to a doubling every two generations (58 years). Prostate cancer rates increased by 85 percent between 1975 and 2002 (SEER 2006). Part of this increase can be explained by better detection, but increased incidence has also been accompanied by an increase in mortality - which better detection cannot explain. Prostate cancer is now the most common cancer among U.S. men, and the second most lethal, killing an estimated 27,000 men in the year 2007 alone (SEER 2007). Infertility rates are notoriously difficult to track, but researchers estimate a 20 percent increase in the last decade, with an estimated 7.3 million American couples currently facing infertility (Barrett 2006). As mentioned above, polycystic ovarian syndrome affects 5 to 10 percent of women of childbearing age, and is a leading cause of infertility (Jakubowicz 2002). In addition, reduced secretion of follicle stimulating hormone can impair fertility in men. Epidemiological studies link BPA to polycystic ovarian syndrome in women, and reduced secretion of follicle stimulating hormone in men (Takeuchi et al. 2006; Hanaoka et al. 2002). Insulin resistance has also increased in incidence and is a major predictor for type II diabetes; interestingly, women with polycystic ovarian syndrome also often develop insulin resistance as well (AHA 2007). It is estimated that 30 million people in the US may have insulin resistance. A recent study from Europe has also found a link between exposure to low doses of BPA and insulin resistance. In this study, adult mice that were exposed to low doses of BPA — 10 ug/kg/day for four days (Alonso-Magdalena, Morimoto et al. 2006). The exposed animals were found to have sustained increases in serum insulin levels after just two days of exposure and impaired glucose tolerance after four days. Increased insulin levels are associated with Type 2 diabetes. A relationship between diabetes and environmental contaminants is beginning to emerge in the scientific literature. Dioxin exposure was first discovered as a contributing factor to diabetes among military personnel who worked with dioxin-containing Agent Orange during the Vietnam War. A link to six other persistent toxins was recently reported in a study of 2000 North Carolinans (Lee, Lee et al. 2006, as reported in OSF 2006). While obesity is often thought of as the major risk factor for diabetes, it was not a significant contributor to disease in those participants with the lowest-level contaminant exposure. Further research will clarify the contribution of environmental chemicals to the diabetes epidemic. In the meantime, the possibility that BPA plays role in provoking insulin resistance in humans bears more attention. Causal relationships between environmental exposures and health effects are often difficult to establish because of many factors, including non-standardized diagnosis of diseases, difficulties ascertaining exposure to ubiquitous environmental contaminants, and inadequate statistical power to address other contributing factors. Endocrine disruptors, such as BPA, may very well play a part in the etiology of classic reproductive disorders and cancers, as well as diseases not often linked to hormonal activity — immune system conditions, learning and behavioral disorders, diabetes, and even obesity. If BPA does indeed contribute to any of these epidemic disorders, the potential ramifications for public health are far-reaching. Toxicity studies involving rodent exposure to BPA should not be considered in a void, but rather should be framed within the current context of clinical concerns for the U.S. population.